I think I graduated out of winter mode today by taking a break from birdwatching & bird photography to snap pics of this little butterfly. 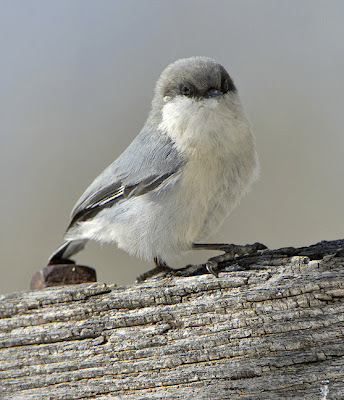 Sure, Mourning Cloaks can pop up at almost any time if things warm up enough (the adults hibernate), but today my friend Nathan Pieplow and I came across this Hoary Elfin up in the Boulder County foothills while trying to track down Red Crossbills. 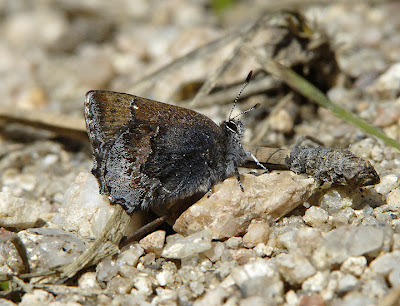 These little butterflies hatch really early in the spring- great to see after a long break from butterflies around here. From left to right that's Garrett, Willy (yours truly), and Jim. 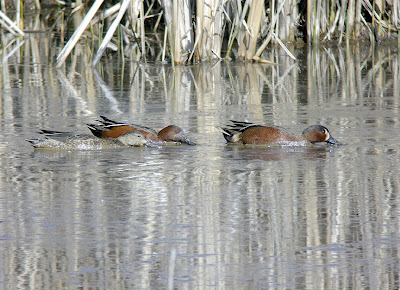 This year, the bird is hanging out with a pair of "normal" Cinnamon Teal (I say "normal" because they look good phenotypically, but who knows what genes they carry.) Interestingly, recent DNA "barcode" analysis showed no detectable genetic differences in the two. There have to be some genetic differences, though, even if undetectable with current technology. Outside of the genetics lab, CITEs and BWTEs usually tell each other apart. 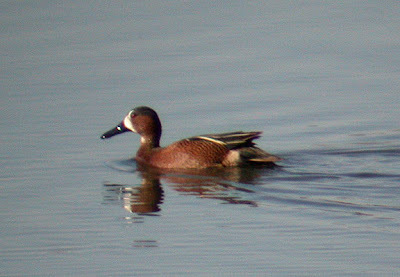 Besides the field mark differences, the two segregate themselves by migration timing (in Colorado, Cinnamon Teal are earlier to arrive and later to depart) and they usually hang out separately (but of course, this bird's parents didn't follow that rule...) Anyway, It is cool to compare & contrast the males side-by-side to see the differences. 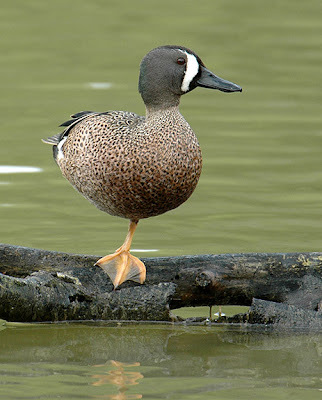 I'm also throwing in a pic of a classic male Blue-winged Teal that I took a few years ago in Texas for comparison and to see the blend of traits that this hybrid ended up with. 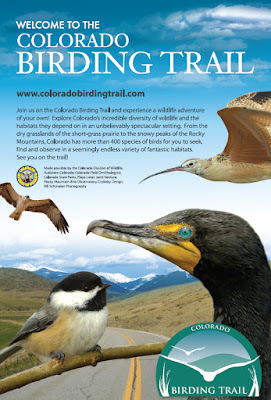 Just as Turkey Vultures are returning to Colorado, they also show up in today's Monty. Now that's what I'm talking about right there with hard-core bird feeding! I'll even forgive the crow call coming from the TUVUs because of that squirrel tail sticking out of the bag. ... lay, lay again. 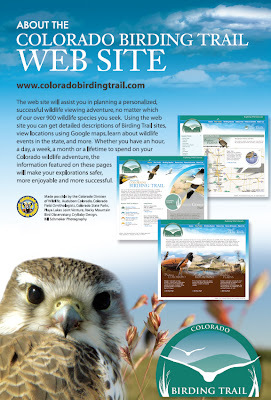 Yes, the Valmont Plant Great Horned Owls are back in business (thanks to faithful reader Julie for the heads-up!) 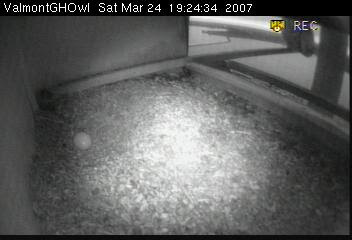 After a nesting failure and the subsequent removal of the clutch, momma owl has laid another egg. 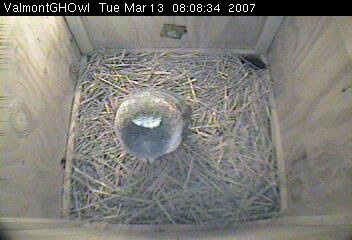 It looks like the egg was laid shortly after 3 pm yesterday (March 24). 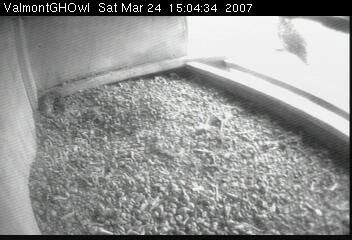 At 3:04 there is no egg, but you can see the owl perched out on the, um, perch. After that she looks like she is inspecting her accomplishment, and then she stayed on the scrape for several hours (er, nesting in her nest? 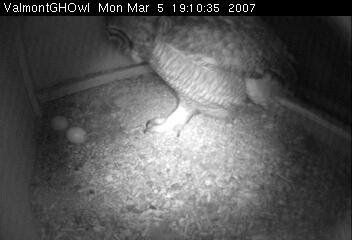 ), but a quick break around 7:24 pm to see what dad was up to showed an egg present. 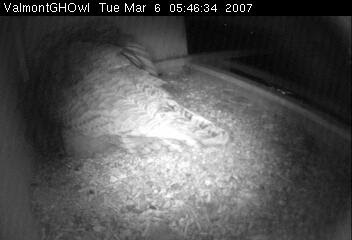 All night, the owl only took a few breaks, none lasting over 20 minutes. 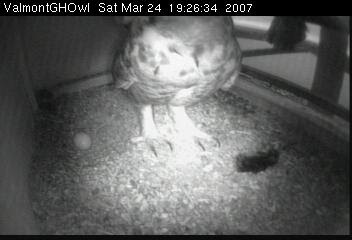 Hopefully she learned her lesson and won't be taking off for hours or even the whole night without incubating the egg, like she did on her failed first attempt. Dad is helping out too- brought a nice little snack around 7:26 pm. 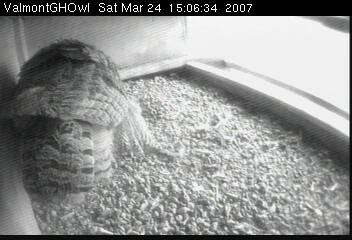 He also had a peek at GHOW-to-be when he delivered a chunky breakfast a little before 4 pm- looks like some kind of vole with a short tail like that? 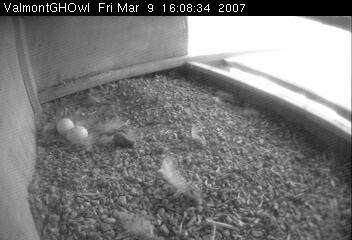 Oh, and for a minute I thought they were up to two eggs- but later pics show there is still only one there- I think the other white blob is part of her feathered foot. 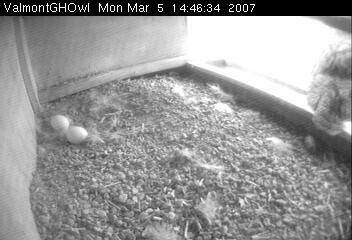 Anyway, I hope that the mom got her first-year jitters out of her system on the lost batch and settles in to hatch this egg (or eggs to follow) properly. 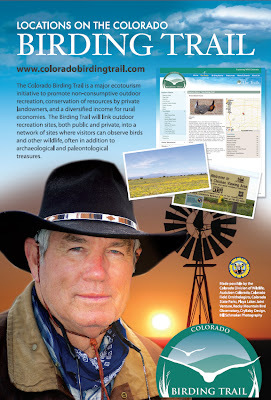 Hopefully we'll also have peeks at what's going on with the Valmont Barn Owls in the coming weeks, too. 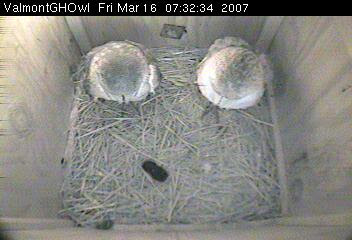 Progress in the Boulder Barn Owl box- this morning a pair of owls are roosting in the box. 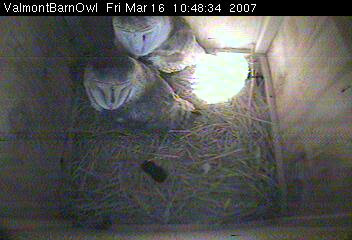 The Valmont Owl Cam is toggling between the Great Horned Owl box (nesting failed there this spring) and the Barn Owl box throughout the day, so if you go to the live image you may or may not see Barn Owls. Fortunately, you can run back through the previous 24 hours' worth of images in two-minute intervals to see what has transpired recently. 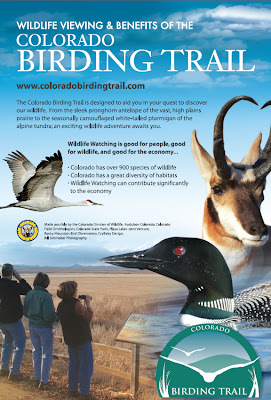 The funny thing is that Barn Owls are really hard to get in Boulder County (where the Valmont Plant is) and unless you get special access, you can only see this box by scoping it from about a mile away. 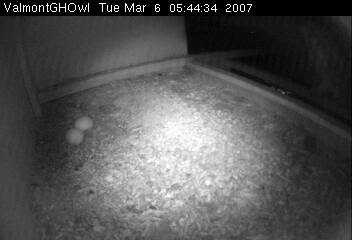 Good luck with that, since Barn Owls usually don't emerge until it is fully dark. 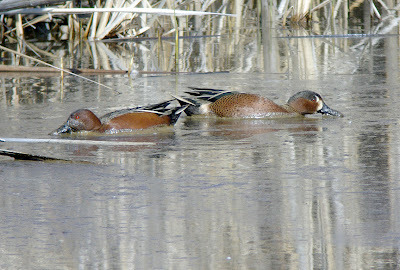 Oh, well- still nice to know these birds are there. Hey- get that sun out of my face!! 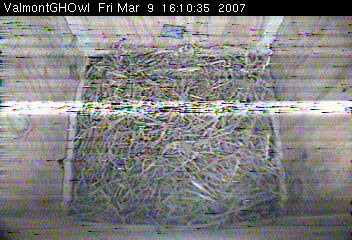 News from the Valmont Station Owl Cam- they have switched the cam over to the Barn Owl nest box after the failure of the Great Horned Owl nest. 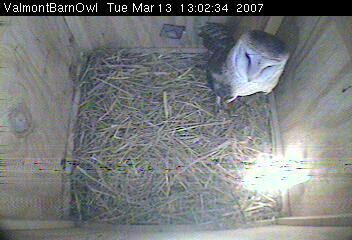 There's one Barn Owl in the house today, and the view is from above so usually the owl looks kind of funny. It did look up once, though, confirming its identity. 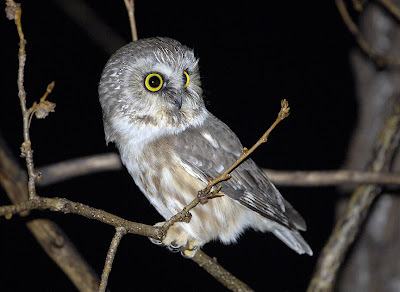 I heard a calling Barn Owl on my sojourn to the Northern Saw-Whet Owl the other night, and I wonder if it was one of the birds in the territory of the Valmont Barn Owls, since I was within a mile of that nest box when I heard it. 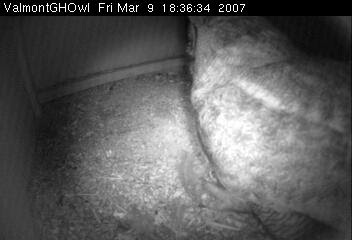 Anyway, stay tuned for more developments- hope the Barn Owls do better than the Great Horned Owls did this year. 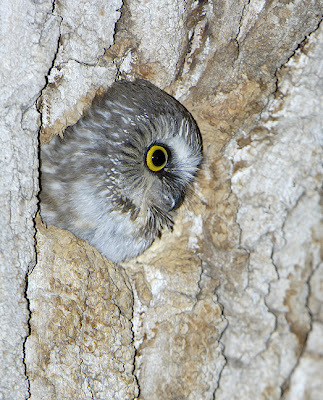 A few weeks ago I posted about a sweet little Northern Pygmy-Owl that I found. 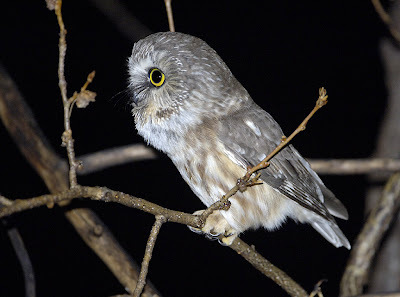 I had an another excellent encounter with a small owl a couple of nights ago, when my friend Nathan Pieplow guided me to a vocal Northern Saw-whet Owl that another local birder (Walter Szeliga) found last week. Nathan had been out to the owl's territory for a few successive nights to get sound recordings- he's a top-flight bird recordist (look for his upcoming article in Birding Magazine.) Sure enough, as soon as we got into position and stopped, the bird could be heard toot-toot-tooting away. We enjoyed listening to the variations on its song- basically is was tooting fast or faster, sometimes soft and sometimes loud and occasionally throwing in a little more "jazz". Then it moved to a more open area with a big cottonwood and a few smaller trees, where we could easily walk without crashing around through undergrowth. All in all, this was one of the most satisfying owling experiences I've had. 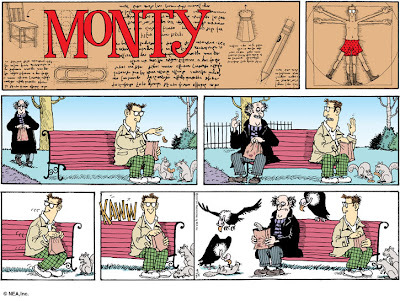 Birds in the Funnies- Eye Yi Yiiiii! Funniest Pearls in a while- and bird-themed, to boot! That is some mean swooping heron- I wonder if they ever vagrate to these parts. Bravo, Pastis! 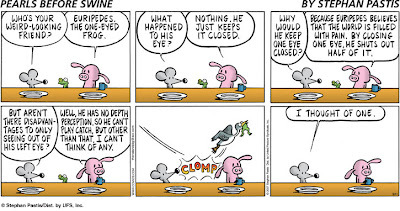 Birds in the Funnies- He has mom's eyes? See, it's funny because mom & dad look alike. And they look like every other penguin in the colony. And they look like every other penguin drawn in the comics. Get it? Huh? 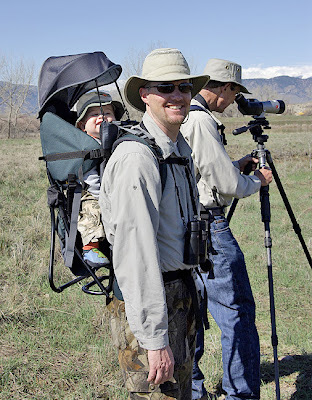 Birds in the Funnies- Daddy, can we keep him? 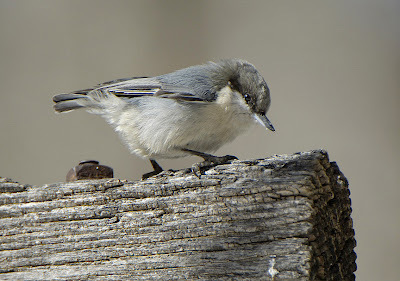 Last weekend there were only a few dozen birds coming and going, but about 4 times a sub-group came down to feeders (well, actually sunflower-filled wooden salad bowls) on the ground in front of the restaurant. 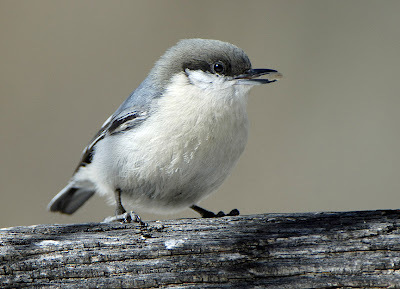 Birds coming down to eat are amazingly tolerant of people as long as you move slowly. 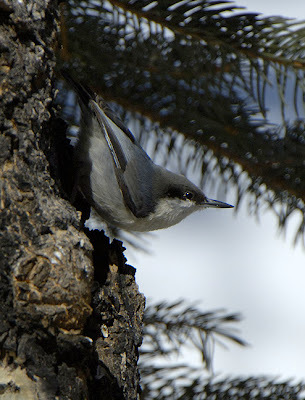 I settled in on a snowbank nearby with the sun at my back and just enjoyed the proximity of these stunning birds- a mix of about 3/4 Brown-capped and 1/4 Gray-crowned. While the looks and lighting were much better for these birds than the ones on the shady side of the house, a photo of a bird wallowing around in a bowl of seed doesn't quite conjure the feelings of tundra and winter stoicism that I associate with these birds. But the male Hepburn's had the decency to pause on the edge of an interesting rock, surrounded by snow. Part of the bowl is still in the background, but the focus on it is real soft and if you want to believe the myth, you can imagine it is just a brown boulder in the snow-covered background. 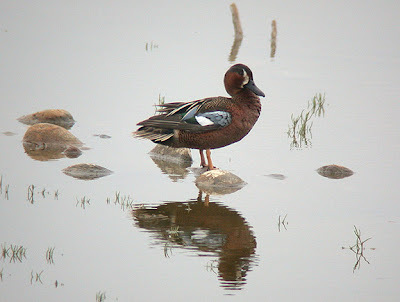 several peculiarities with the female this season. 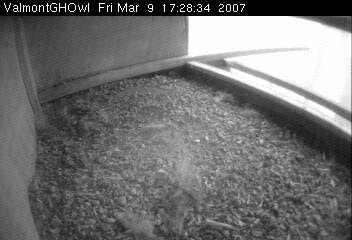 Trouble at the Owl Cam? 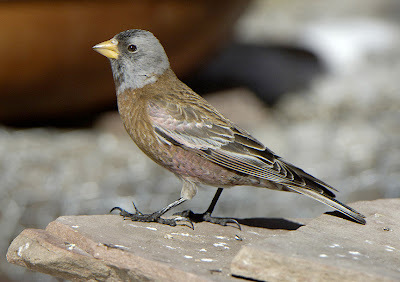 Yesterday my dad and I were at a famous Rosy-Finch spot, the Fawnbrook Inn in Allenspark, Colorado. 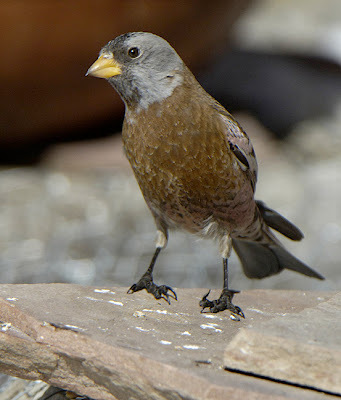 While rosies gave us some action, there was a lot of no-finch time. I noticed PYNUs regularly coming in to a feeder. Many would grab their seed and disappear into the trees to hammer them open in seclusion, but a few would use a nearby weathered timber sign post as their anvil. 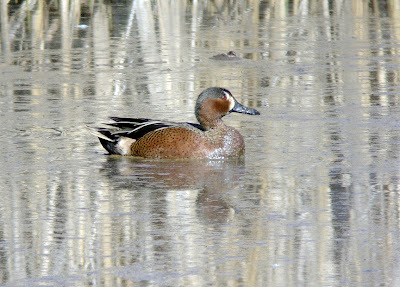 Between feeding sorties I eased into position about 10 feet away and just hung out quietly. I wasn't hiding, but by just standing still and being patient I wasn't worrying the birds, either. 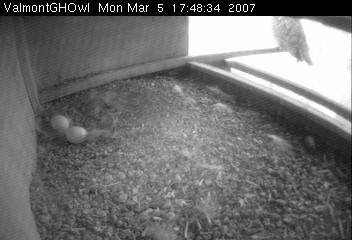 Pretty soon another round of feeding began and Pygs would take their nut to "hatch" on the board. Their movements were too fast to react to a good pose, so instead I tried to judge when the light looked twinkly in their eyes and then fired bursts hoping that some of the frames would look nice. I got lots of throwaways, but so what? I also lucked out and got a PYNU in a more natural perch, clinging upside-down to an aspen trunk as it waited for its turn to dart in and get a sunflower seed. These things really defy gravity, which I guess isn't as hard as it sounds when you only weigh about 10 grams. 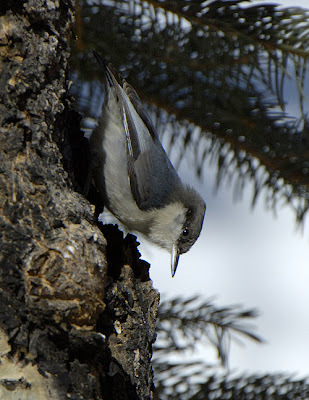 I think the last pic with the inverted bird's head facing out is an iconic pose for nuthatches.